Yesterday marked the 177th anniversary of an interesting point in American history. On April 4, 1841, President William Henry Harrison died of pneumonia, only 31 days after taking office. He became the first President to die in office, and remains to this day the President who had the shortest tenure in the White House. We should add, incidentally, that Tyler may not have been motivated solely by a desire to avoid a constitutional crisis: by becoming the President in name, Tyler’s annual salary increased five-fold, from $5,000 a year to $25,000 a year. And Tyler wasn’t exactly a good guy, either — he was a slave owner who later supported the Confederacy and died while serving in the Confederate Congress. But eventually the Congress went along with Tyler’s approach to presidential succession, and even though his foes derided him as “His Accidency,” the “Tyler precedent” on presidential succession was established — to be followed after the assassination of Abraham Lincoln, the assassination of James Garfield, and all of the other instances of vice presidential succession until the 25th Amendment, which established specific rules on the succession process, was ratified more than 100 years later. In the middle of the 19th century, the Whigs were one of the two major parties in American politics. Founded in 1834 as a group that opposed Democrat Andrew Jackson, they won two presidential elections and counted as their members some of the most prominent American politicians of the day. Abraham Lincoln started his political career as a Whig. So did William Seward, Lincoln’s Secretary of State. Daniel Webster and Henry Clay, two of the most prominent members of the United States Congress during that era, were Whigs. The slogan “Tippecanoe and Tyler too” helped to carry Whig candidate William Henry Harrison to the presidency in the election of 1840. Another Whig, Zachary Taylor, was elected President in 1848. But by 1856 — only two presidential elections later — the Whig Party was gone, unable to field a candidate for national office. It broke apart on the shoals of the slavery issue, irreparably splintered by the Compromise of 1850 and the Kansas-Nebraska Act, with southern Whigs supporting the South’s detestable “peculiar institution” and northern “conscience Whigs,” like Lincoln, recognizing that slavery had to be ended or the country would tear itself apart. As the old Whig Party fell apart, a new party, the Republicans, arose. Led by Lincoln and Seward, the Republicans opposed slavery, fought the Civil War, and then became the second party in America’s two-party system. Since 1860, those two parties have been the Democrats and the Republicans. Could what happened to the Whig Party happen to one of the two major parties of the modern day? Probably not. The modern political parties are much more well-funded and entrenched, with permanent national staffs and constant fund-raising and electoral laws that make it difficult to get third-party candidates onto the ballot. And yet . . . I think about the Whigs when I consider the choice presented this year by the two major parties. According to the polls, the vast majority of Americans are extremely unhappy with the candidates who apparently will carry the banners of their respective parties come November. I’ve written before about the flaws of the candidates, but what about the flaws of the parties, and the process they created? The two parties took opposite approaches to the 2016 election. The Republicans had a huge field of 18 current and former Governors, Senators, and business leaders, had free-for-all debates, and ended up with Donald Trump. The Democrats treated Hillary Clinton as the presumptive nominee, seemingly discouraged other prominent national Democrats from running, and now see an increasingly unpopular Clinton locked in an improbable, lingering fight with a 70-plus Socialist and facing increasing scrutiny about her personal ethics and credibility. In short, the parties took opposite approaches to selection of their candidates, but each produced candidates who seem to be deeply, deeply flawed. Many people out here in the Midwest speak of the choice the parties have given them with a bitterness that goes beyond the normal dismissive comments about politicians. There is a strong sense that the political parties have utterly failed; many believe that the process is corrupt, and that we should blow it all up and start over. In short, the views of the electorate probably are a lot like the views of Americans in the 1850s, when the Whigs turned out to be an empty shell with no substance that collapsed and vanished forever. Could the Democrats or Republicans go the way of the Whigs? I wonder. Last night, Kish and I watched 12 Years a Slave. It is a well-made, gripping film that features an exceptional performance by Chiwetel Ejiofor as Solomon Northrup, a free man who is lured away from his New York home, drugged, and then sold into more than a decade of slavery. For all of its beautiful cinematography and superb acting, the movie is incredibly difficult to watch because of the oppressive reality of slavery and the bloody and terrible beatings, the hangings, and the lashings of Northrup and his fellow slaves. Of course, that’s the point — at least in part. For too long, in movies like Gone With The Wind, the reality of slavery in America was sugarcoated and airbrushed into fantasyland. 12 Years a Slave, with its depiction of the story of one man’s hellish experience on several plantations in the deep South, helps to balance the scales. Movies can make us laugh, make us cry, make us think, and make us wonder. 12 Years a Slave falls into the latter categories. One of the great values of the movie is its exposure of the many different people who participated in the slavery system and facilitated its enormous evil. For every brutish slave owner and sadistic overseer there were a host of slave auctioneers, jailers, tradesmen, ship owners, and fugitive slave hunters who helped to keep the system running. 12 Years a Slave shows them all doing their jobs, apparently untroubled by the fact that they are trading in the lives of human beings. How did that happen? How did those people come to accept and participate in such a perverse and inherently wicked institution? In our fast-moving modern world, where everyone focuses on the future and things a decade old are viewed as the distant past, it’s important to remember that there is a deep and rancid stain on the history of the United States that grew and endured for decades. 12 Years a Slave is a fine movie in its own right, but its powerful message about the dark corner of our heritage makes it a must-see film. 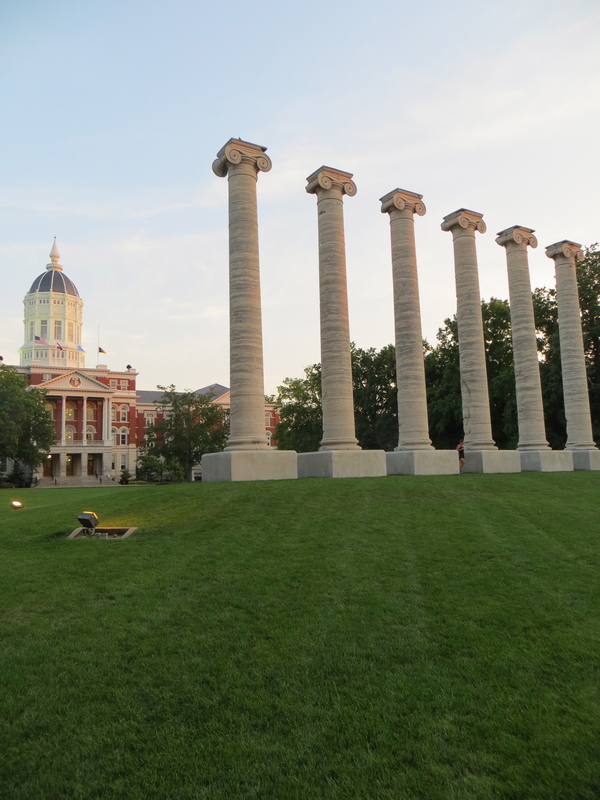 Richard has a very interesting piece in today’s Columbia Missourian about the role of slavery in the history of the University of Missouri. It addresses, in detail after fascinating detail, the slave-owning pasts of some of the central figures in the early history of the school, and the efforts of their descendants to try to atone for that fact. It’s an excellent piece about a very difficult subject, and it poses a question that is impossible to answer for those of us in the modern world: how could a person like James Sidney Rollins, who professed to be enlightened and was such a strong supporter of public education that he earned the title “father of the University of Missouri,” nevertheless have justified and rationalized being a slave owner, unable to recognize the fundamental, unforgivable injustice in his claim to own fellow human beings? I urge all of our Webner House readers to read Richard’s piece and think about how many of the institutions of modern America have some roots in that terrible institution that will forever be a stain on America’s past. Stories like Richard’s that reveal more of that past do us all an important service. 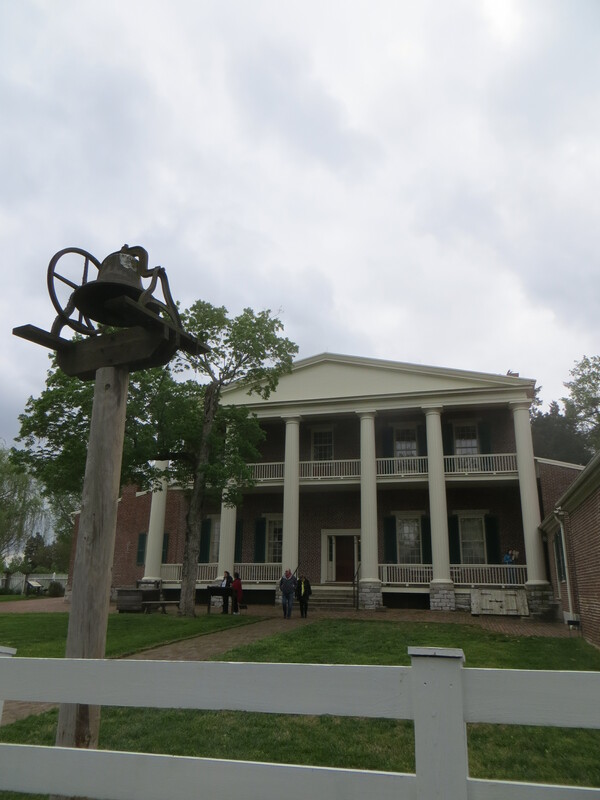 Yesterday Kish and I went to the Hermitage, the plantation home of Andrew Jackson. 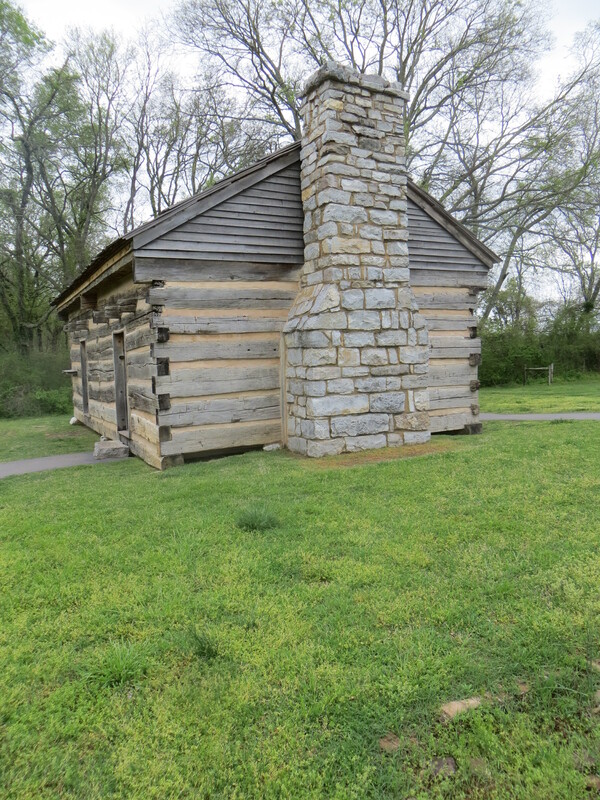 It is conveniently located within the footprint of metropolitan Nashville, and it’s well worth a visit — both to learn a bit more about one of our Presidents, but also to spend some time pondering the imponderable question of why any American, much less a President, thought it was acceptable to own slaves. The Hermitage consists of a large brick pillared and porticoed plantation home and its grounds, an adjoining garden in which Jackson and members of his family are buried, and a series of walking paths that take you to other places and buildings on the plantation grounds, some of which are still standing and some of which are visible only in the form of foundations traced on the ground. The main building is beautiful and well-preserved, with original wallpaper, lighting fixtures, and furnishings. You can see Jackson’s study, his bed and his chamber pot, the weekly newspapers he read and bound in large books and the room where he died. You can hear from the friendly guides wearing period costume about the house and Jackson’s family and his love for his wife and their adoption of their son. 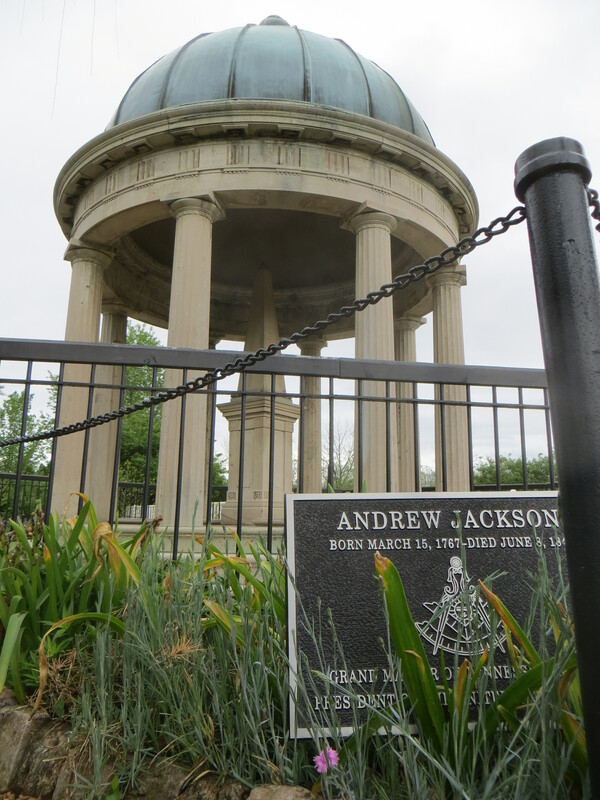 You can visit his grave in a beautiful garden, where Old Hickory lies beneath a small Greek dome. The real impact of the tour for us, however, didn’t occur until we walked away from the main building and its well-kept grounds and began touring the fields and outbuildngs, where Jackson’s slaves toiled. Jackson eventually owned 150 slaves who did the real work on the plantation. They planted and picked cotton and operated the cotton gin that Jackson built, churned butter, tended the horses, mucked out the stables, and cooked the meals. Little is known about them, and when you walk back to the area where the slaves lived and see photos of their lost possessions that preservationists have uncovered, you cannot help but feel an immense sadness and anger. I commend that Hermitage for making a significant effort to cast light on the fact that one of our most famous Presidents was a large slaveholder who bought and sold slaves as chattel and achieved wealth through their uncompensated labors. He may not have been the cruelest master in the Old South, but he somehow rationalized the ownership of fellow human beings. That simple fact, for me, makes the rest of the Jackson story a lot less relevant. Years after Jackson’s death, during the midst of the Civil War, the Union Army captured Nashville and slaves were free to leave. The vast majority of the slaves on the Hermitage plantation promptly left, choosing an uncertain future over continued interaction with their former masters. That tells you all you need to know about slavery. I’m happy to report that sanity reigns in San Diego — in the federal court, at least. PETA’s lawyer says the organization will now decide how to proceed, and presumably will consider whether to appeal the dismissal of the case to the Ninth Circuit Court of Appeals — traditionally viewed as the most liberal of the various federal appellate courts. If PETA decides not to appeal to that forum, it will tell us a lot about whether the whole purpose of the lawsuit was simply to elicit the publicity that PETA craves.